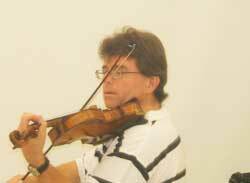 Violinist Edgar Gabriel is equally comfortable performing and teaching classical, jazz, fiddle and rock music. He has performed with such diverse groups as Mannheim Steamroller, Chicago Opera and Steppenwolf Theaters. Edgar's expertise has won him positions with the world renown Cirque du Soleil. He can be heard on numerous recordings including Rachel Barton Pine's Storming the Citadel. His publication STRING GROOVE teaches improvisation, fiddling and other styles outside of traditional violin repertoire. You can see him perform with his group STRINGFUSION. Edgar Gabriel holds an undergraduate degree in music from Northern Illinois University and a Master of Music in Jazz Studies from DePaul University.